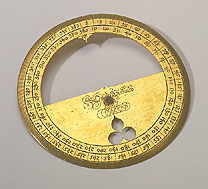 The limb of the instrument is graduated with a scale of degrees divided to the degree, numbered from north from 5 to 360 by 5. The top part is hollow and has a small point inscribed 'ME'. The lower part is inscribed with the signature and date 'David Usslaub' '1599'. Below it is a hollow decoration in the form of a three-lobe. The back of the instrument is blank.